Organizing your garage is not something you would include in your home improvement project unless you want to make it larger. Despite this, however, it is important to keep your garages organized and neat, especially if you store lots of things in it beside your car. In many homes, garages double as storage rooms and workshops. So, it stands to reason that it could easily get untidy and messy. Here are some basic handyman tips to help you organize your garage. Go through every item in your garage – Probably the best way to start organizing your garage is to go through every item that you have stored inside it. Experts suggest organizing these items in three different categories: keep, donate or trash. Obviously, what you will most likely use will go to the keep pile. Those that you will no longer use but are still in good condition, you may want to consider donating to charity. And finally, the things that can no longer be used should be disposed of properly. Appropriately mark each container– Labeling each container where you put your stuff is the epitome of organization. Even if you use see-through or clear containers, properly labeling them will save you lots of time when you need to find a tool or a décor item, especially when you’re in a rush. This is why buying a label printer is a good investment. Put away occasional and other rarely utilized things higher up the shelf– This effectively helps you free the lower layers of your shelves or racks for more important and frequently used tools and other items. So whether you use open shelves or cabinets, it will be easy for you to get the item that you need if it is at an easily reachable level. If you need help putting up the shelves, you can always ask help from your local handyman. This way you can have your shelves set up according to your preference. Putting everything back in its place after being used– No matter how tempting it is to place things in a lower shelf or box after using them, refrain from doing so. It is also not advisable to have a storage bin for things you need to put back in their boxes but don’t have the time to do it. Although this seems convenient, it doesn’t help you keep your garage organized and neat. 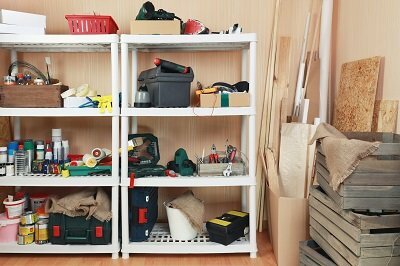 Make time to replace containers and bins on their shelves after taking them down to get a certain tool. Practice putting things back in their rightful place and you’ll be surprised to realize how rarely you need to do a garage organizing task! Ask help from professionals if needed- There are times when broken or non-functioning appliance are stored in the garage just in case. Keep clutter to a minimum by having your appliance fixed by a professional handyman instead of storing in the garage. When you are in need of a handyman, you can always rely on Handyman Conway.